Who'll save the World from Mark Matson? This article was first posted July 1, 2010, last updated on February 22, 2012. Note: (07/09/2010): An alert Retire Early reader noticed that Mark Matson's Matrix Asset Allocation has a newer fee schedule that gives its co-advisors more flexibility in deciding what level of fees are assessed on the client's portfolio. The charts and tables in this article have been revised to show the maximum and minimum annual fee allowed under the Matrix Asset Allocation program. Note: (09/08/2010): Today I received a letter from Mark Matson alerting me to some inaccuracies in this article regarding his fees. Mr. Matson also takes issue with some of the verbs and adjectives used in the article. Here's a link to the full text of Mr. Matson's letter of September 8th. 1) The article mis-identifies Melissa Matson, the operator of the Rich Chick website as Mr. Matson's wife. She is in fact his sister-in-law. 2) Mr. Matson objects to the use of the term "affiliate" or "affiliated advisor" to describe the financial advisors who invest their clients' money with him under the Matrix Asset Allocation program. He prefers the term "co-adviser". I'm happy to use his term. 3) Mr. Matson notes that the expense ratios for his Free Market Funds include the expenses of the acquired DFA Funds in the portfolio, and as a result overstate his fees when compared to other DFA-approved advisors mentioned in the article. 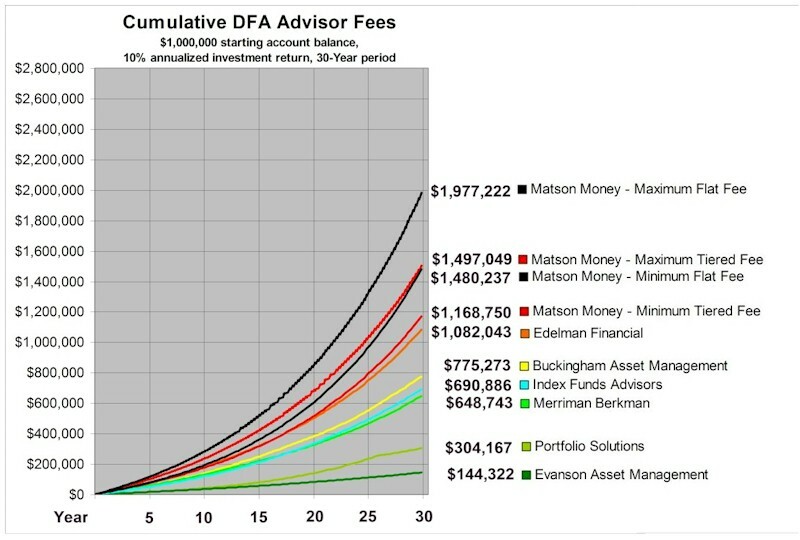 All of the charts and tables in the article have been completely revised to show the differences in both fees and expenses for Matson Money and the other DFA-approved advisers mentioned. Erroneous fee figures contained within the text of the article have also been corrected. 4) Mr. Matson objects to several verbs and adjectives used in the article (e.g., "skim" in reference to fees, "hapless" in reference to clients, etc.) They have either been removed, or, if retained, his objection is noted in the article. Of course, Retire Early apologizes for, and regrets the errors and inconsistencies in the original article. Watching CNBC a while back, I was delighted to find a handsome, young man, Mark Matson willing to help folks save for retirement. Visiting his web site, I see that Mr. Matson, a DFA-approved advisor, is a video dynamo, appearing frequently on CNBC, Fox News, and ABC. He also has a weekly web broadcast Mark Matson TV with the slogan "Save the Investor. Save the World." Matson's sister-in-law, Melissa even maintains a Rich Chick web site with financial advice for "Sassy Girls." It all seemed very fresh and exciting to me, but is it a good deal for Matson's investors? Spending a few minutes on the Matson website, I found he does a thriving business coaching financial advisors on how to use his Million Dollar ModelTM to increase their income by assessing management fees on their clients' portfolios. As an early retiree, working "as little as one week per quarter" is particularly appealing to me. The Million Dollar ModelTM seems to be an excellent deal for Mark Matson and his co-advisers who together assess an annual management fee & expenses that is among the highest of the DFA-approved advisers we've examined (see Table Four, below), but what about the clients? Where are the customers' yachts? Mr. Matson warns me that the lack of any client testamonials on his web site should not be construed to mean that his clients are dissatisfied. Under SEC rules (specifically Rule 206(4)-1) he is prohibited from including client testamonials in his advertising materials. He is however permitted to include testamonials from co-advisers on the web site promoting the Million Dollar ModelTM . Mr. Matson also writes on Page 3 of his letter, "There is no prohibition relating to such communications other than the general antifraud provision that requires that all marketing materials of advisers. whether registered or not, must be true and not misleading." Thus, I have every reason to believe that one or more of the graduates of Mr. Matson's Million Dollar ModelTM training are now working "As Little As One Week Per Quarter" while having "More Fun Than You Ever Dreamed Possible In Your Financial Practice". Mr. Matson also notes that the Million Dollar ModelTM website mentioned above is targeted at co-advisers, not clients or potential clients. That is understandable. If a client found out that he was paying these kind of fees & expenses while his "co-adviser" was only working one week out of thirteen, it would certainly be a head turner. Doing a bit of due diligence on the Matson operation at the SEC web site, I find that Mark Matson's Matrix Asset Allocation has some $2.4 billion in assets under management from about 11,000 investors. Matrix Asset Allocation allows its co-advisors to charge an annual management fee of 0.99% to 1.40% on the first $500,000, 0.50% to 1.00% on the next $500,000, 0.40% to 0.75% on the next $3 million, and 0.25% to 0.50% on the portion of the client's account over $4 million. As an alternative to the tiered fee schedule above, Matson also allows its co-advisors to charge a flat fee of 0.75% to 1.40% applied to a portfolio of any size. Matson Money collects a management fee of 0.50% through the expense ratio of the Free Market Funds. One interesting wrinkle to the Matson operation are the Free Market Funds. Instead of investing his clients' money directly into DFA funds through a custodian like Charles Schwab, as is the practice of most DFA-approved advisors, Mark Matson created these three fund-of-funds portfolios that together invest in 21 different DFA mutual funds. The Free Market Funds' expense ratio includes three parts, 1) the expense ratio of the acquired DFA Funds in the portfolio, 2) a 0.50% management fee for Matson Money, and 3) "Other Expenses" that cover the cost of operating the fund that range from 0.22% to 0.25% depending on the fund. For a client with a 30% Domestic Equity, 30% International, and 40% Fixed Income asset allocation, the "Other Expenses" for the Overall Portfolio would be 0.24%. This arrangement offers some savings for clients with small accounts (i.e., less than $400,000), but can be much more expensive for clients with larger accounts, as Table One below illustrates. 0.36% of principal, subject to a $25 minimum and $49.95 maximum. A client investing in DFA Funds through Matson Money and one of its co-advisers incurs fees and expenses from both the co-adviser and the Free Market Funds. They are summurized in Table Two. dated December 31, 2009. The following portfolio allocation was assumed. includes the Matson Money management fee of 0.50% plus the Fund's "Other Expenses". to Matson Money, 0.34% expenses for the acquired DFA Funds, and 0.24% of Other Expenses. Mr. Matson explains his business model as follows. Matson Money does not accept clients directly. He only takes clients referred to him by a co-adviser (many of whom have completed Matson's Million Dollar ModelTM training). "Matson Money is responsible for all asset allocation, portfolio management and asset rebalancing decisions, the co-advisers provide a variety of services to the joint clients. Co-advisers are responsible for all direct client communications and are also responsible for collecting and periodically updating information about clients' investment objectives, risk tolerance, financial situation, time horizon, current investments, and personal financial goals in the form of a Questionaire designed by Matson Money." They then enter into a tri-party contract between the client, Matson Money, and the co-adviser. The co-adviser is free to negotiate his fee with the client as long as it remains within the ranges prescribed by Matson Money. In other words, you can't hire Matson Money on your own for a 0.50% annual fee. You must buy the package deal that includes Matson Money, The Free Market Funds, and the co-adviser who referred your account to Matson Money. Obviously, this tag-team approach is going to be more expensive than hiring a single adviser. So you need to carefully evaluate what, if any, additional services are being provided and whether they merit the additional cost. 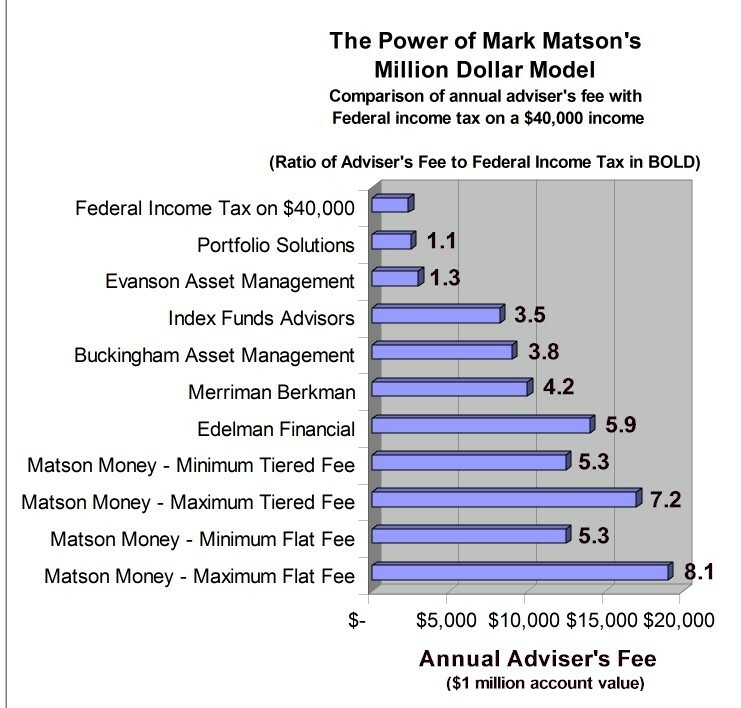 Measuring the Power of the Million Dollar ModelTM -- Why is Mark Matson taking more of your money than the IRS? In retirement, many people are justifiably concerned with how much they pay in taxes on the money they withdraw from their portfolio. As astonishing as it may seem, it's sometimes possible for a financial adviser to take more of your money than the IRS. In fact, one way to measure the effectiveness of a financial adviser's business model is to compare his annual fee with what the client pays in Federal income taxes. A financial adviser who is able to get a client to sign a contract that allows the adviser to take more of the client's money than the IRS, has a business model of great power and persuasion. For 2010, a retiree taking a 4% withdrawal (i.e. $40,000) from a $1 million account would pay $2,358 in Federal income taxes, assuming the whole $40,000 was taxed as ordinary income, and the retiree was filing as a married couple with the standard deduction. Of course, many retirees pay less if some of their withdrawal comes from capital gains, dividends, or a return of capital. The chart below compares the annual fee for the seven largest DFA-approved advisers examined and shows the ratio between the adviser's fee and the client's Federal income tax liability. Based on the analysis above, the power of Mr. Matson's Million Dollar ModelTM is evident. Its ability to garner fees in the range of 5 to 8 times what a retired client would pay in Federal income taxes is far higher than the other DFA-approved advisers. He and his co-advisers are certainly to be congratulated for their salesmanship and persuasiveness. I would definitely recommend the Million Dollar ModelTM program to a financial adviser looking to increase both his fee income and leisure time. In fact, the $1,499 fee for the three-day Million Dollar ModelTM training program seems like a bargain when compared to the annual fees being extracted from the clients. If you go shopping for a DFA-approved advisor, you'll find a wide range of fees for this service. DFA advisors follow two basic models in assessing their portfolio management fees; a fixed annual fee that more or less correlates to the amount of time the advisor spends on the account, or a percentage of the assets under management (AUM) where the annual fee increases with the growth in value even if the amount of time the advisor needs to devote to the account does not. There are also two versions of the AUM model; 1) a straight percentage of the total account value, and 2) a tiered fee structure where the first dollar in the account is assessed a higher fee than the last. The table below illustrates the difference. Table Three. Comparison of straight AUM vs. tiered AUM fees for a $2 million account. To examine the range of fees charged by DFA advisors, the SEC disclosure database was used to collect information on the firms in the table below. Firm size (i.e., Assets Under Management (AUM) and number of clients) was obtained from the latest SEC Form ADV on file. The schedule of fees was obtained from either the Form ADV or the firms' website. All of the DFA-approved advisers listed in the table below, with the exception of Matson Money, invest their clients' funds through a Custodian like Charles Schwab or TD Waterhouse and incur a transaction fee for each trade. For a typical client portfolio with 10-15 DFA Funds these transaction fees would range from a minimum of $250 to a maximum of $750 per year depending on the size of the account. Matson Money is a bit different in that it invests its clients' funds in their proprietary Free Market Funds. The Free Market Funds' expense ratio includes the expense ratio of the acquired DFA Funds in the portfolio, a 0.50% management fee, and "Other Expenses" ranging from 0.22% to 0.25% that cover the cost of operating the fund. For the asset allocation assumed, the breakdown is 0.50% management fee, 0.34% expenses for acquired DFA Funds, and 0.24% Other Expenses totaling 1.08%. 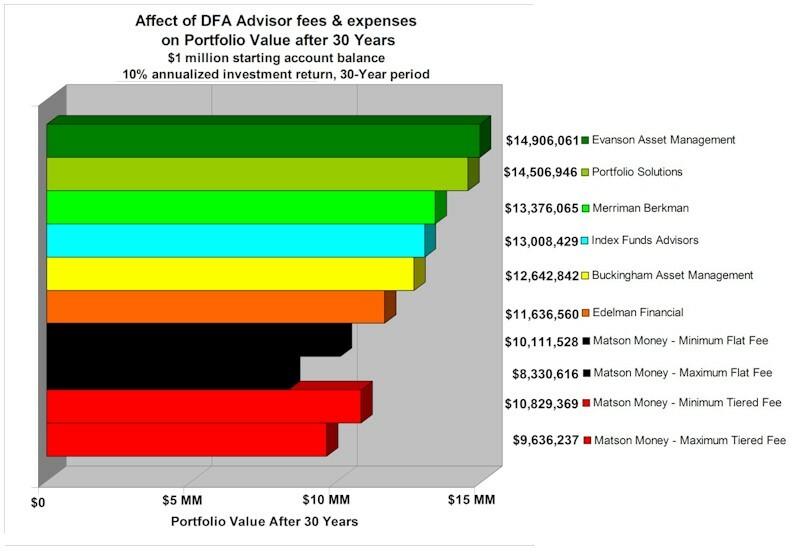 In the previous version of this article, no adjustment was made for the fact that Matson Money's fee included the expenses of the acquired DFA Funds plus the operating expenses of the Free Market Funds, while the fees for the other DFA-approved advisers examined did not include their DFA fund expenses plus transaction costs. 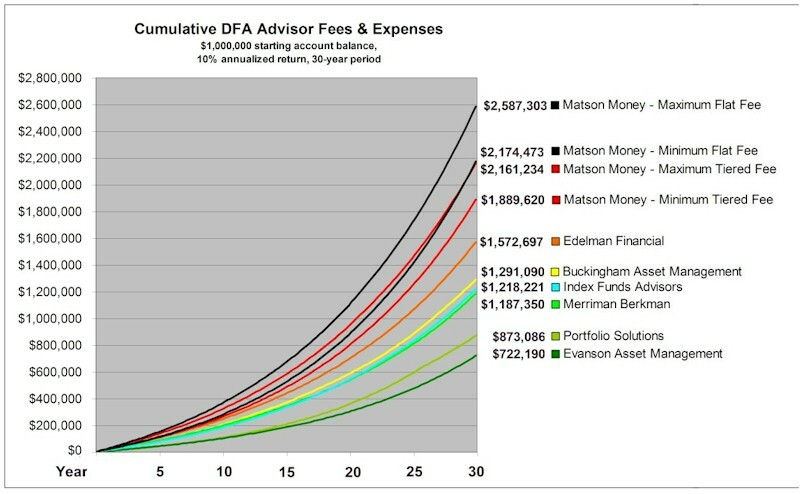 To place Matson Money on the same basis as the other advisors and provide an apples-to-apples comparison, the same 0.34% for the acquired DFA Funds expense and the $1,049 in annual transaction costs for 21 DFA Funds has been added to each of the DFA-approved advisors' fees in the table below. Note(1): Includes both Matson Money and co-adviser's fee. Note(2): For all advisors except Matson Money, the fee numbers in bold include the advisor's fee, plus 0.34% for the expenses of the DFA Funds in the client's portfolio, plus $1,049 per year in transaction costs for a 21 funds. For a $1 MM portfolio these added costs are $4,449 per annum, for a $2 MM portfolio, $7,849 per annum, for a $5 MM portfolio, $18,049 per annum, and for a $10 MM portfolio, $35,049 per annum. For Matson, the fee numbers in bold include both the Matson Money fee and the co-adviser's fee, the 0.34% for the acquired DFA Funds expenses and the 0.24% Other Expenses of the Free Market Funds. For a $1 MM portfolio these added costs are $5,800 per annum, for a $2 MM portfolio, $11,600 per annum, for a $5 MM portfolio, $29,000 per annum, and for a $10 MM portfolio, $58,000 per annum. If you're not careful, you could wind up paying tens of thousands of dollars for a few hours of the advisor's time. Assessing a client's risk tolerance and allocating a portfolio across 10 to 15 index funds should take a few hours at most for a competent advisor. Occasional rebalancing and tax-loss harvesting, perhaps an hour or two per year. Even a fixed-fee DFA advisor charging $2,000 per year could effectively be billing you $400 to $500 per hour for his time. That's more than you'd pay an attorney or CPA in most areas. For larger portfolios (say $5 million to $10 million), the most expensive DFA advisors charge annual fees in the range of $25,000 to $248,000. At this level, they'd really need to be providing you with a hundred hours or more per year of high-end, professional investment counseling and financial planning to make this look reasonable. If you can't get a good picture of what additional services they are providing, the man-hours associated with that activity, and who's actually doing the work (i.e., the advisor himself or the clerical staff), you're probably getting hosed. Of course, like all of the high fee advisers on the list above, Mr. Matson notes that he and his co-advisers offer customer service, client meetings, and investor education opportunities than the low fee advisers don't -- and there are real differences. For example, Evanson Asset Management has a list of several classic investing texts on its website that a client can read for more information. Perhaps Mr. Matson and his co-advisers will sit the client down and actually read those texts to him with the production values of a Garrison Keillor recital. It's up the potential client to decide if the substantial additional fee (up to $16,000/yr. more on a $1 million account) is worth the level of service and educational opportunities provided. Over an investor's lifetime, a high-fee DFA advisor can capture a sizable portion of the client's assets for his own account. The chart below compares the cumulative fee collected over a 30-year period for the seven largest DFA advisors (in terms of client assets under management) examined. Matson Money collected over $1.8 million more in fees ($1,832,900 to be exact) than the least expensive firm on the list, Evanson Asset Management. In terms of an "investor education opportunity", you could probably send most of the Gosselin Family to Harvard for that $1.8 million difference in fees. To perform this analysis, the DFA advisors' management fee was deducted from the account quarterly. For fixed fee advisors, an annual fee in the middle of the stated range was assumed (e.g., $3,000 per year for Evanson Asset Management) This fixed annual fee was then indexed for inflation by 3% per annum over the 30-year period. If you want to do your own analysis on a DFA advisor's fees, here's an Excel spreadsheet use can use. Click here. Because of the effects of compounding, each dollar in fees & expenses that your DFA-approved advisor siphons from your account results in a $3 or $4 reduction in the value of your account over 30 years (assuming a 10% annualized investment return.) 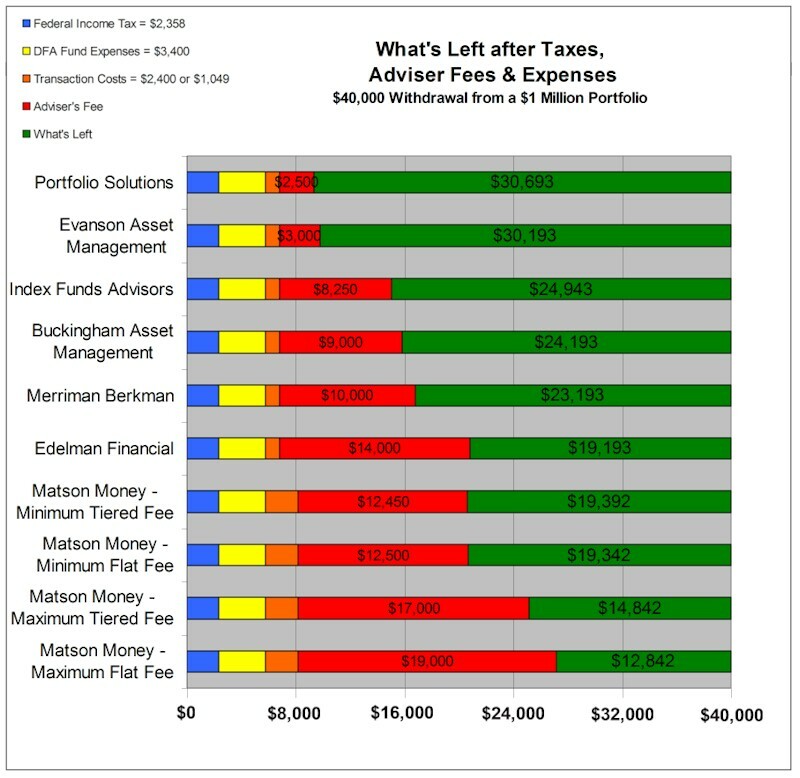 As the chart below illustrates, while there was more than a $1.8 million difference ($1,865,113 to be exact) in the cumulative fees & expenses collected between Matson Money's maximum flat fee and lowest cost advisor (Evanson Asset Management), Matson's account value at the end of 30 years was an astonishing $6,575,445 less than the account value for the Evanson. Are "high fee" DFA-approved advisors smarter than their lower cost competitors? Do they produce higher investment returns? Probably not. First of all, (as the chart above shows) a high fee produces a significant reduction the size of the client's account over 30 years. The $500,000 to $1.8 million in additional fees that a high-fee advisor siphons from the account creates a significant headwind to overcome just to get back to where you'd be with a low-fee advisor. Remember, while the advisor's fee is guaranteed by contract, the promise of superior results are not. An advisor's ability to extract an outsized fee from a client is more of a testament to his sales, marketing, and self-promotion skills than any superior investment acumen. To a large extent, a DFA-approved advisor's investment return is produced by the proprietary quantitative techniques employed by Dimension Fund Advisors in stock selection and managing the fund, and adherance to the Fama-French Three Factor Model in portfolio allocation (i.e., wide diversification with overweighing in small-cap and value equities.) While you'll find variations between advisors in the recommended asset allocation for a given risk tolerance, a recent paper from Duke University showed that no advisor can reliably predict the exact asset allocation that will produce a higher return for the next year. Low cost, fixed-fee DFA-approved advisors simply sell their services based on the cost savings. For high fee DFA-advisors, it's a bit more complicated -- especially if the potential client has any feel for the small amount of time it takes for a competent professional to assess risk tolerance and allocate a portfolio across 10 to 15 index funds. A low-fee DFA advisor might not understand investing -- That may be true, but there are also "high fee" DFA-approved advisors who don't understand investing. Just because the advisor can extract a higher fee from the client doesn't mean he has more investment acumen. A low-fee DFA advisor might not properly assess your risk tolerance -- An advisor can only base your risk tolerance on the information you provide them. Most will have some kind of questionaire for you to fill out. The competent ones will point out that many novice investors overestimate their risk tolerance. A low-fee DFA advisor might not form a 'personal relationship' with you -- It's true that a low-fee advisor won't spend as much time with you. He likely won't offer you free tickets to a concert or ball game, or take you out to dinner. But when you look at the multi-million dollar difference in fees over 30 years, that free dinner may well be your most expensive meal of the year. A low-fee DFA advisor might not use an "all-DFA" portfolio -- Since DFA doesn't have the best performing fund in every asset class, there are a lot of DFA-approved advisors who don't recommend a 100% DFA portfolio to their clients. Indeed, an advisor who just blindly puts everything into DFA funds without first investigating to see if there is a better performing alternative for each asset class probably isn't doing a good job for his clients. A low-fee DFA advisor might not do as good job at tax loss harvesting -- One high-fee advisor on the list, Buckingham Asset Management advertises their willingness to manage a portfolio of individual bonds at no additional cost. This allows them to take advantage of tax loss harvesting at the individual bond level. Is this enough of an advantage to offset Buckingham's much higher fees? Let's investigate. For example, for a client with a $5 million portfolio, there is a $22,000 per year difference between Buckingham's annual fee of $25,000 and the $3,000 charged by a fixed-fee advisor. If we assume the client has a 50% allocation to fixed income ($2,500,000), he would be paying between $2,750 and $4,750 in mutual fund management fees, depending on the fund. (Vanguard's Short-Term Bond ETF (BSV) has an expense ratio of 0.11%, DFA's One-Year Fixed Income Fund DFIHX has an expense ratio of 0.18%, while the DFA Two-Year Global Fixed Income Index DFGFX has an expense ratio of 0.19%.) Of course, a portfolio of individual bonds would incur brokerage commissons and the additional costs of the bid/asked spread on each transaction. These costs probably offset the savings in bond fund management expenses. For a taxpayer in the top Federal bracket, short term gains are taxed at 35% and long-term gains are taxed at 15%. That means Buckingham would have to generate somewhere between $63,000 and $147,000 in tax losses to net the client a $22,000 annual savings on his tax return (depending on whether it's a long-term or short-term loss.) Could Buckingham deliver the $22,000 in annual tax savings required to absorb its higher fees with any regularity? I'm skeptical. A low-fee DFA-approved advisor might not give you the kind of quarterly report you like -- DFA-approved advisors do differ in the detail and quality of their reporting. It's certainly reasonable to review this as part of your investment advisor selection process. But it probably doesn't make sense to spend an additional $500,000 to $2 million in fees over 30 years just because you don't like the font size on an account statement. A low-fee DFA-approved advisor might skimp on office staff, equipment, and amenities -- Good point. No doubt low fee advisors don't provide free donuts and coffee for the staff and rent space in a Class B building. For the more important stuff, like whether or not the advisor has errors & omissions insurance or an off-site place to store back-up copies of his records (as the SEC requires), you can easily ask to see the Certificate of Coverage for his policy or the name of the firm that stores his records. A low-fee advisor might not help you with your estate planning or taxes -- That may be, but on say a $5 million account, the more than $90,000 difference in annual fees between the lowest cost and highest cost advisor would allow you to hire a high-powered estate attorney or CPA on your own if you need them. What to conclude from this analysis? The wide range of fees charged by DFA-approved advisors offers potential clients considerable opportunity for savings. Especially for investors with larger accounts, the assets under management (AUM) fee model appears to result in an annual charge that's wildly inflated given the small number of man-hours required to manage a portfolio of 10 to 15 index funds. If a "high-fee" DFA-approved advisor can't give you a detailed description for what additional services he'll be providing for the tens of thousands of dollars in additional annual fees, it may make sense to hire one of his low-cost, fixed-fee competitors. Those making annual withdrawals from their portfolios in retirement have a special interest in limiting fees & expenses. Unfortunately, no matter how handsome or well-dressed your financial adviser is, no "money fairy" is going to magically appear to pay his or her annual fee. It needs to be deducted from your retirement withdrawal just like any other annual expense. The chart below shows "what's left" after taxes, fees & expenses for the seven large DFA-approved advisers examined. For example, for a retiree taking a 4% or $40,000 annual withdrawal from a $1 million account, all seven would have Federal income taxes of $2,358 and DFA fund expenses of $3,400. The annual "Other Expenses" for Matson's Free Market Funds at $2,400 is a bit higher than the $1,049 in Schwab transaction costs we've assumed for the other six DFA-approved advisers. The big difference is the size of the adviser's fee and what the retiree has left. We started this discussion by asking, "Where are the customers' yachts? A client who was sold Mr. Matson's Maximum Flat Fee of $19,000 would only have $12,842 left to live on after taxes, DFA mutual fund expenses, and adviser fees & expenses. That doesn't appear to be enough to fund much of a yacht -- maybe a second-hand kayak and a used wetsuit? Of course, most of Mr. Matson's clients should be able to supplement the meager remains of their $40,000 annual portfolio withdrawal with Social Security -- at least until Mr. Matson realizes his dream of ending entitlements. A January 30, 2010 Wall Street Journal article had Mark Matson advocating the end of entitlement programs like Social Security and Medicare. On only $12,842/year after expenses, even a millionaire paying Mark Matson's fees would need a generous monthly Social Security stipend to have any kind of reasonable lifestyle in retirement. Index Funds Advisors: The High Cost Of Low-Fee Advisors -- A high-fee DFA advisor uses the "fear appeal" to defends his fees. Evanson Asset Management: Fees and Services -- A low, fixed-fee DFA advisor explains why the high-fee guys are wrong. Financial Advisor Magazine (Oct 2002) DFA Advisors Clean Up. Financial Advisor Magazine (Mar 2001) Going Their Own Way.